Home > Information > Are Plastic Bags Always a Bad Thing? There’s probably no single item that has become quite such an iconic emblem of our throw-away culture as the plastic bag. Whether it’s images of them floating like manufactured jellyfish in the sea, fluttering in increasingly tattered strips on roadside fences, or blowing like thistledown along our streets, plastic bags are just bad, bad, bad! It may be the popular mantra – but is it true? Are plastic bags always a bad thing? The best answer to this, like so many of the environmental quandaries of our age, is probably a definite ‘perhaps’, or at least a ‘maybe’. It depends. It used to be a familiar ritual – you bought something, the assistant put it into a plastic bag, you took it away. For years, nobody ever really questioned it and the cumulative effect of all this automatic bagging was astounding; as recently as 2007, according to government estimates, every man, woman and child in the UK received an average of nearly 300 plastic bags per year! Since then, as we all know, public consciousness has shifted, supermarkets have encouraged us to take our own reusable bags with us – cutting their costs and improving their profits into the bargain – and plastic bag use has declined by more than half. So what’s wrong with that? Well, nothing, obviously; the problems only really begin when you start to talk about outright bans or taxes. When Ireland, for instance, implemented its 15 Euro cents ‘plastax’ on each bag, their use fell away almost overnight – down to around 20 per person per year, instead of nearly 350. What nobody foresaw, however, was the four-fold increase in brand new bin liner and nappy bag sales that resulted. The obvious implication is that, far from being the ‘one-use’ disposable, environmental nightmare that we might imagine, a plastic bag is arguably the one item in our homes that is most likely to be reused. Now undoubtedly even reused bags will be ending up in landfill, where they’ll take an age to breakdown – but virgin bin-liners are made of sturdier stuff than carriers. How much longer will their thicker plastic lurk buried beneath the earth, unchanged? Perhaps we’d all be better off forgetting about plastic bags altogether and going back to the days when we used paper bags instead. Well, you might think so, but according to life-cycle analysis, unfortunately paper doesn’t come out particularly well by comparison – which probably sounds like the worst kind of environmental heresy, at least until you look at the issues of their production and pollution. While paper bags may seem the ‘greener’ choice, they demand almost 10 times more material to produce, significantly larger quantities of water and sometimes call for chemical bleaching agents too. They’re not as durable as plastic bags either, so a larger number need to be made and when they’ve reached the end of their life, although they do breakdown in landfills, they release greenhouse gases such as carbon dioxide and methane in the process. In a straight fight – and ironic though it seems – promoting thicker plastic ‘bags-for-life’ would probably reduce ordinary plastic bag use more greenly and effectively. The charismatic and somewhat controversial scientist, James Lovelock, has likened our obsession with plastic bags as akin to re-arranging the deckchairs on the Titanic; it risks diverting our attention from bigger and more pressing concerns. He is not alone in his view. While acknowledging that they are a serious litter problem and harmful in the seas, Chris Goodall – author of How to Live a Low Carbon Life and Ten Technologies to Save the Planet – describes plastic bags as an “easy target” because they are so visible. But visibility, he says, doesn’t make them the most important environmental problem of our time. The environment is an incredibly complex system and, as Chief Seattle is famously reported as saying, “all things are connected.” No one would suggest that attempting to reduce our use of any kind of resource is anything other than a good idea, but we need to keep a sense of perspective along the way and accept that simple solutions seldom work in our complicated world, no matter how much we would like it if they did. The bottom line is, today’s struggle with plastic bags is a good cause, and one well worth fighting for – but not at the risk of missing the bigger picture. Assuming the likes of Lovelock and Goodall are right, then while we congratulate ourselves on our attempts to use ever fewer, we may fail to address more fundamental and more immediate dangers. 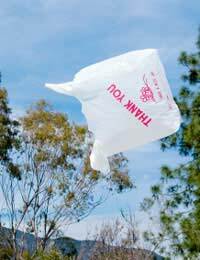 If there’s ever a right time to call plastic bags bad, then it would surely be when they make us do just that.